We just received an anonymous tip from someone who claims to have received an email from Yahoo which says that the company’s Google AdSense counterpart, Publisher Networkbeta , will be shut down by the company in the next 30 days. There’s some chatter about it on Twitter as well, so this looks like it’s coming from a credible source. Apparently, publishers are being pushed to Chitika instead, which has set up this section on its website to “make the transition from Yahoo! Publisher Network as easy as possible”. Yahoo! continuously evaluates and prioritizes our products and services, in alignment with business goals and our continued commitment to deliver the best consumer and advertiser experiences. After conducting an extensive review of the Yahoo! Publisher Network beta program, we have decided to close the program effective April 30, 2010. We expect to deliver final publisher payments for the month ending April 30, 2010 to publishers no later than May 31, 2010. All publishers eligible for 1099s for the 2010 tax year will have those mailed by January 31, 2011. Because our content will no longer be delivered to your ad unit spaces after April 30, 2010, we recommend removing all YPN ad code from your pages by that date. 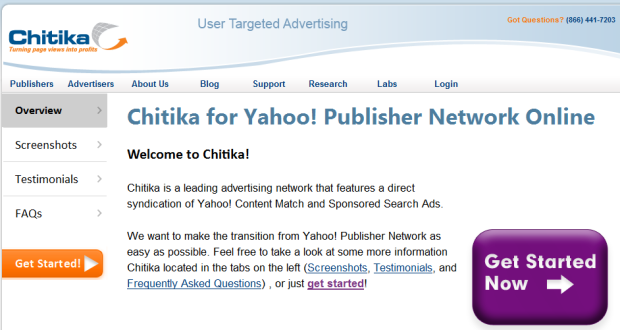 For the opportunity to continue earning revenue, we suggest using Chitika, a leading advertising network that syndicates Yahoo! Content Match and Sponsored Search ads. Chitika has set up a special process for YPNO beta publishers to participate in its platform. Click here for more information. We thank you for your participation in the Yahoo! Publisher Network beta. If you have any questions regarding this announcement, please contact our Support Team at (866) 785-2636, Monday through Friday from 7:00 a.m. to 5:00 p.m. PDT. The YPN blog remains silent about the axing, so far (update: live now). We have e-mails in with both Chitika and Yahoo for more information. One thing I’m trying to figure out is why Yahoo doesn’t refer publishers to its search partner Microsoft instead, who operates adCenter. For background: the Yahoo! Publisher Network (aka YPN) was launched in August 2005 and has been labeled a beta product by Yahoo up until today. It provided registered publishers with cost-per-click contextual advertising as well as various tools and services to assist them in building and improving their websites. While it will continue to exist for some of its large, premium publishers, the Yahoo Publisher Network Beta for small publishers will be axed. Chitika handily provided publishers with a FAQ page for more information about switching to them.